The bishops of Spoleto had a palace near the Duomo from at least 1067. The first Palazzo Vescovile on the current site was probably built in ca. 1178. The earliest surviving reference to an episcopal place occurs in 1067, in the document in which Bishop Andrea II instituted (or re-organised) the Cathedral Chapter and endowed the canons with a considerable patrimony. This included a parcel of land that extended as far as this palace, which was built between Santa Maria del Vescovado (the first Duomo) and the city walls. The fact that this episcopal complex had probably been established on the edge of the city suggests that the city centre was already developed by the time it was built. This palace was probably damaged during the sack of Spoleto by the Emperor Frederick I in 1155. His biographer refers specifically to the storming of the highest part of the city, "just opposite the principal church, the bishop's seat" which had seemed to be impregnable because of the slope of the mountain. He goes on to say that Frederick I left the city on the following morning because of the stench of fire and rotting corpses. Spoleto had a series of schismatic bishops in the following two decades, none of whom left a mark on the city. Santa Maria del Vescovado and the episcopal palace therefore presumably remained in ruins. A resurgence of the city’s fortunes probably began in 1177 with the peace signed between Frederick I and Pope Alexander III and the investiture by the latter of Bishop Transarico. He seems to have moved to San Gregorio Maggiore in ca. 1178 so that the old episcopal palace could be demolished to make way for the new Duomo. The present episcopal palace stands on an artificial terrace that was built to extend the Roman forum. The so-called Sostruzione Sillane (1st century BC), which supports the west and north sides of this terrace, is attributed to the Consul Lucius Cornelius Sulla (hence "Sillane"), whose army sacked and then occupied Spoletium in 83BC. Its precise function is unknown, although it was probably part of a fortified structure. According to tradition, the Emperor Theoderic built a palace on the terrace here in the 5th century that was later used by Lombard and Carolingian dukes. The terrace was certainly the site of the Benedictine nunnery of Sant’ Eufemia, which is documented in the reign of the Emperor Otto II (973-83). An inscription (14th century) in the old chancellery of Palazzo Vescovile (see below) apparently reproduces part of an imperial diploma in which the Emperor Henry II ceded the church and nunnery to (the otherwise unknown) Conte Acodo in 1017 at the behest of Archbishop Heribert of Cologne. The fact that the complex was in the gift of the Emperor adds weight to the theory that this was indeed the site of the ducal palace. 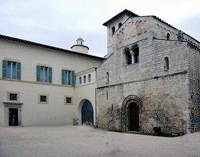 The complex subsequently passed into the hands of the bishops of Spoleto, perhaps at the end of the papal schism in 1177. As noted above, Bishop Transarico left the old episcopal palace for what must have been temporary accommodation at San Gregorio Maggiore in ca. 1178: it seems likely that the first episcopal palace on the present site was built soon after. However, the earliest surviving documentation of this palace “close to San Giovanni” dates to 1231. This is a reference to the fact that the church of Sant' Eufemia was dedicated additionally to St John of Spoleto from ca. 980. ✴the north wing culminated in a tower, with the door to the old chancellery to the right of it. The gardens behind the north wing, on the edge of the terrace above Via del Duomo, are also not shown. The palace radically restructured after earthquakes in 1571, 1703 and 1762. The fresco above the entrance in Via Saffi and the arms there commemorate the visit of Pope Pius VII in 1800. ✴The Eroli arms at the corner of Via dell' Arringo and Via Saffi (the right of the entrance above) commemorates the fact that the Eroli bishops restored the south wing in the late 15th and early 16th centuries. It was lowered by a storey after the earthquake of 1762. ✴Bishop Pietro Orsini rebuilt the north wing after the earthquake of 1571. ✴The east wing was demolished in 1954 during the restoration of the apse of Sant' Eufemia. An overhead gallery now connects the upper floor of the north wing to the church. (The cupola visible in this photograph belongs to the chapel (see below). ✴The colonnade along the west side of the courtyard now leads to the entrance to the Museo Diocesano. These are visible through glass if the door is open. 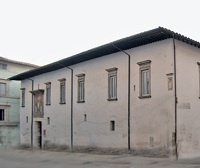 The Museo Diocesano is arranged in the rooms on the first floor of the north wing that formed the Appartamento del Cardinale (i.e. of Bishop Cardinal Cesare Facchinetti (1655-72)). The vaults of most of these rooms were frescoed in the rococo style after the 1762 earthquake. 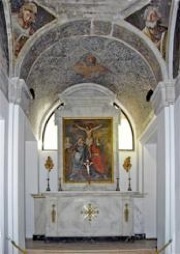 Bishop Cardinal Cesare Facchinetti commissioned the chapel, which now forms part of the Museo Diocesano. It has a square plan and an octagonal dome, with frescoes (ca. 1660) of the four Evangelists in the pendentives. Bishop Pietro Orsini instituted the first seminary here. The plaque under the Barberini arms to the right of the portal records the support of Cardinal Maffeo Barberini (who was Bishop of Spoleto in the period 1608-17 and subsequently elected as Pope Urban VIII). This first seminary was not particularly successful. Bishop Alfonso Visconti re-instituted it in the early 18th century. 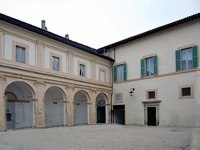 The opening between the Canonica and Palazzo del Seminario leads to their shared cloister (in restoration at January 2009), which has fine views towards the Rocca. Return to Walk I (Palazzo Vescovile) or Walk III (Palazzo del Seminario).